Who do you trust to facilitate transparency? We talk a lot about transparency, but attaining true transparency in the beef business is difficult. It boils down to trust. The Food Marketing Institute (FMI) recently released a new report titled, The Transparency Imperative: Product Labeling from the Consumer Perspective. As the title implies, the survey report provides insight into consumer perspectives around various issues and complexities associated with food transparency. FMI notes that, “Seemingly all of a sudden, consumers began to demand more information about their food products. This has caught the attention of food retailers, suppliers and other stakeholders.” The research is based on an online survey of 2,022 randomly-sampled grocery shoppers 18 years of age or older. Clearly, this is an important topic, especially as the beef industry increasingly grapples with traceability. Most notably, what are the implications of greater supply chain traceability and transparency in terms of beef demand and relationship with consumers? There are any number of key findings within the report that may help answer some of those questions. As such, Industry At A Glance will focus on the FMI report over the coming weeks. This week’s graph highlights the issue of responsibility and trust with respect to transparency. That is, the graph highlights consumer responses regarding who they perceive being responsible for facilitating greater transparency. Interestingly enough, consumers seemingly perceive that responsibility to largely rest upon manufacturers and governmental agencies. However, when it comes to the question of being a trusted source of information about food (where it’s from, how it was produced), farmers and ranchers are the clear winners. 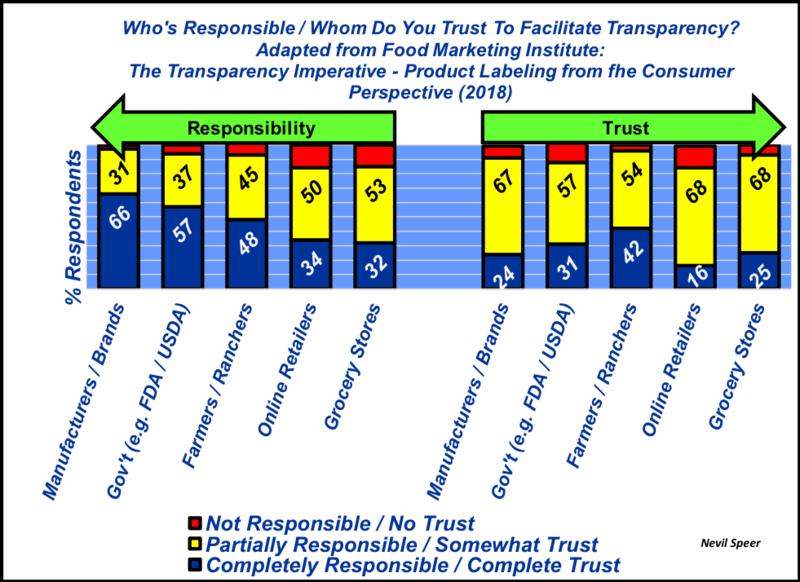 How do you perceive the relationship between responsibility and trust as it relates to food transparency? What’s your assessment of the general trend regarding transparency and traceability for the beef industry in coming years? What’s your perception of the importance of greater transparency to beef demand? Leave your thoughts in the comments section below.